We are here at our last days in Montana and Chief Plenty Coups State Park. We have learned so much during our month here: about the Chief, about the Crow, about Indian War battles and about ourselves – including Elko! Today we spent the morning at the final stop on the to-do list – the Western Heritage Center in Billings. 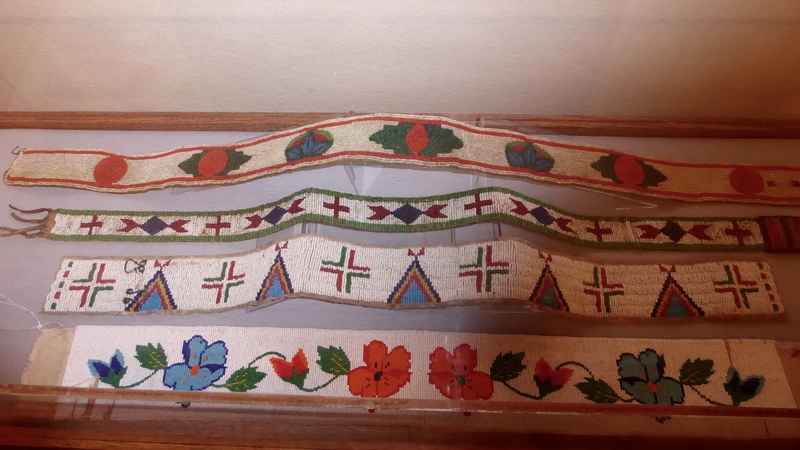 We saw beautiful Indian (Shoshone, Cheyenne and Crow) beadwork and different ways they used animal skins for clothing, accessories and home needs. 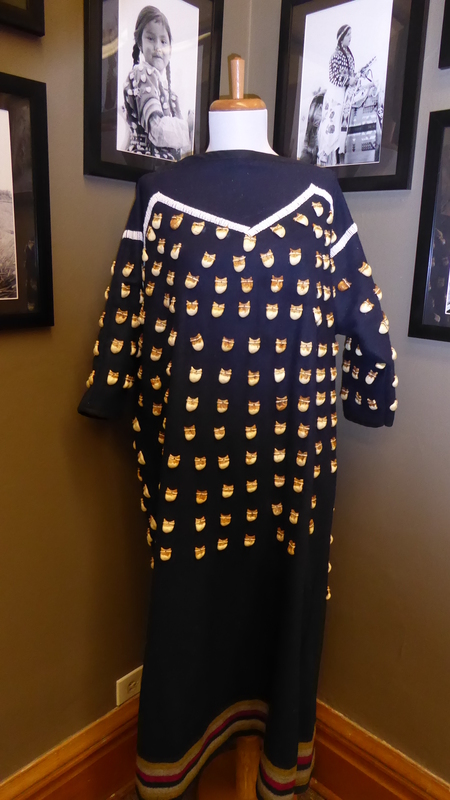 We also saw this Crow Elk Tooth Dress. Only an elk’s two upper incisors are used in these dresses and the number of teeth shows how many elk a hunter has killed and processed. A wife would wear this dress with pride as it was symbolic of her warrior husband’s status. We have seen women wear these dresses during the two pow-wows held at our park. 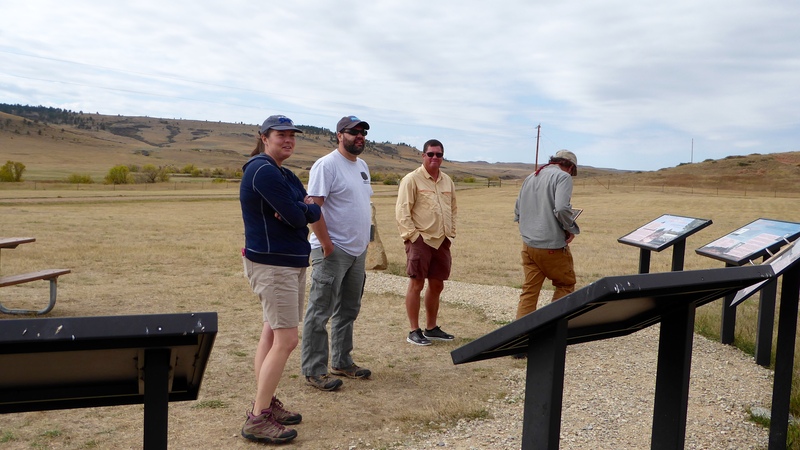 A few weeks ago we went to the Little Big Horn Battlefield and learned about General Custer and the Seventh Cavalry’s battle with the Sioux and Cheyenne. Yesterday we went on a field trip to a related battlefield for an end of the season jaunt with our co-worker friends. 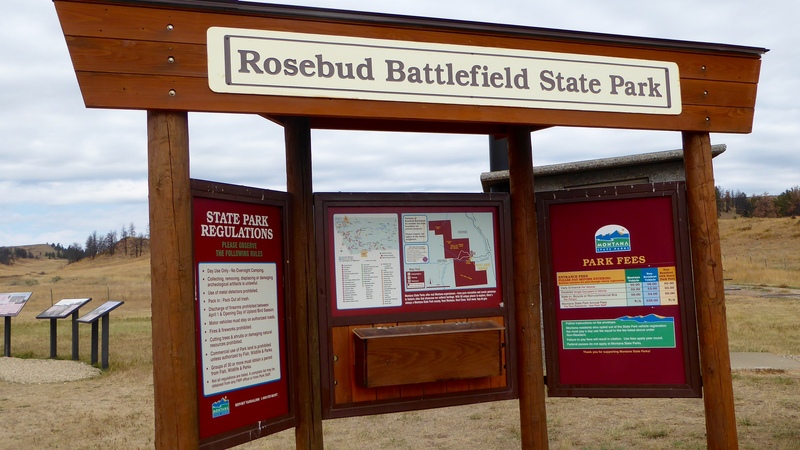 We went to Rosebud Battlefield State Park with Americorp volunteer – Casey, Park Manager – Chris, (Randy), Maintenance lead – Tyler, and maintenance worker – Judy (pictured later). 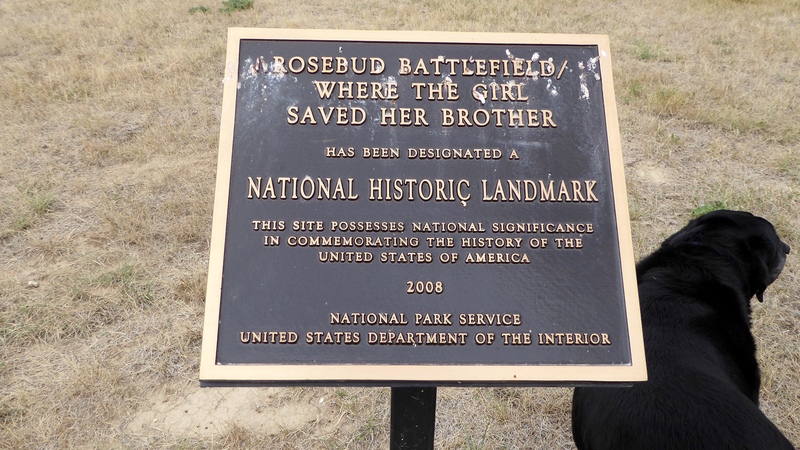 Randy and I hadn’t known about the The Battle of the Rosebud prior to our visit to Little Big Horn. We learned there that General Crook and General Custer were leading different parts of the same effort, trying to trap Indians and return them to reservations by force. General Crook and about 1000 soldiers and 276 Crow and Shoshone scouts, camped on Rosebud creek. They had expected to find the Cheyenne and Lakota (Sioux) camps. The Lakota were led by Oglala warrior Crazy Horse. 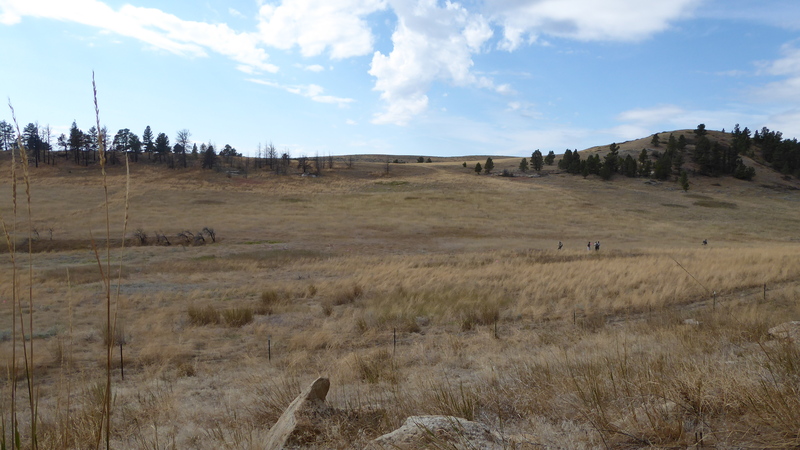 Indians call this battlefield “Where the Girl Saved Her Brother.” A Cheyenne warrior’s horse was shot out from under him and he, vulnerable on foot, was rescued by his sister. She galloped to her brother’s place on the battlefield, he jumped on the back of her horse, and they both escaped. Estimates have death tolls at 9-16 men within Crook’s contingent and 26 Indians. It was said that huge amounts of bullets were used that day so the death toll seems, mercifully, light. Oddly enough, it is believed that the battle ended when the Indians got hungry and left the battlefield. They were done for the day but over the next week the Indians moved north to the Little Bighorn area, ballooning the number that would face General Custer. General Crook took his troops back to Fort Sheridan, Wyoming to restock and regroup. As a result, they were not available to reinforce General Custer at Little Big Horn eight days later. We TOTALLY lucked out in that while we were having our “field trip”, there were (approved) archeologists surveying the battlefield at the same time! A fire went through this area a couple years ago and it revealed much about the 10 mile battlefield. That has re-energized archeological focus. 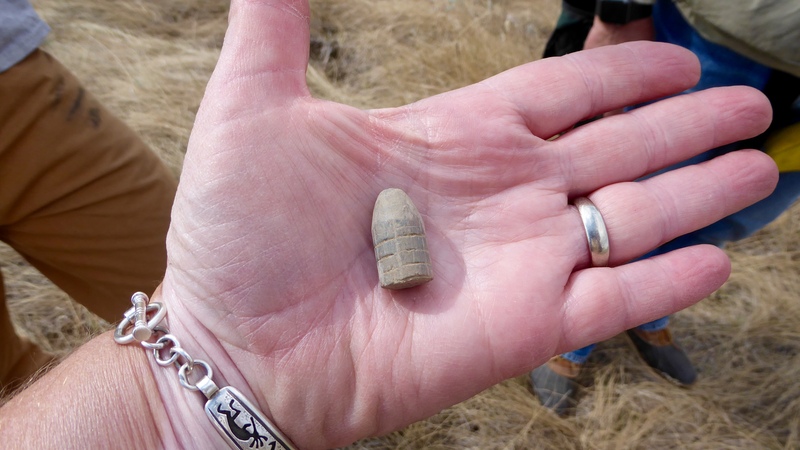 The afternoon we were there, a mere 139 years later, the archeologists, found 5 bullets from the battle using metal detectors. . 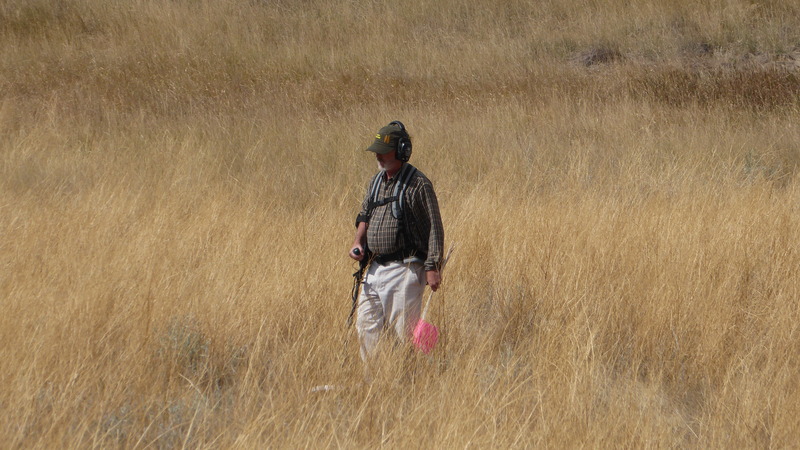 The archeologists were able to identify the bullets and what types of gun they would have been shot from. They were happy to talk to us and show us what they had found. Unfortunately I had nothing to write with, and my brain just doesn’t comprehend gun and bullet information, so my retelling is very basic. This first bullet could have been fired by anyone, cavalry, scouts or Indians. The rifles using these bullets were surplus from the Civil War and everyone had them. This second bullet is known to have been fired by a Cavalry soldier, given the rifle that used it. The archeologist told us that, after 6-8 firings, the rifles of the day would be so dirty with powder that their accuracy was greatly reduced. Perhaps that explains the seemingly low numbers of casualties in this battle. 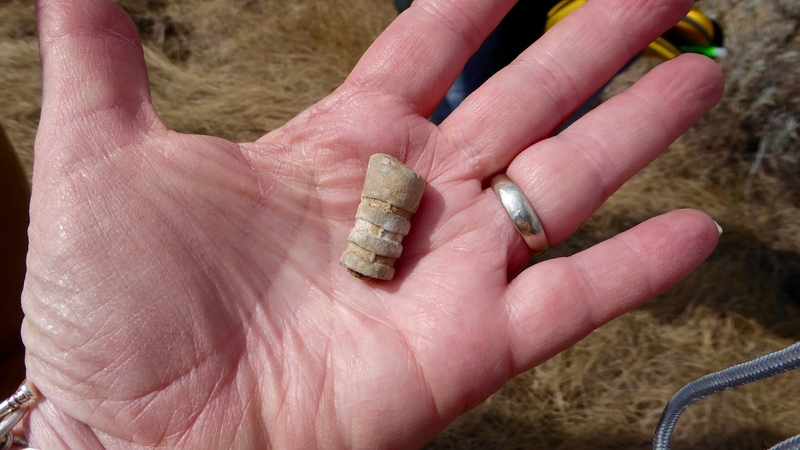 As an aside, battlefield archeologists and forencics have been able to trace the same gun to three different battles based on bullet striations. 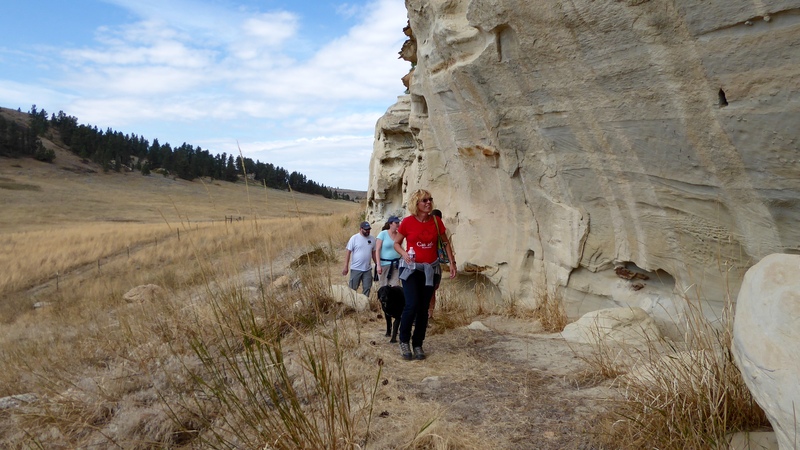 As we were leaving the battlefield, with Judy in the lead, we passed next to a sandstone rock formation with pictures and names carved upon it, many old and some, unfortunately, more current. 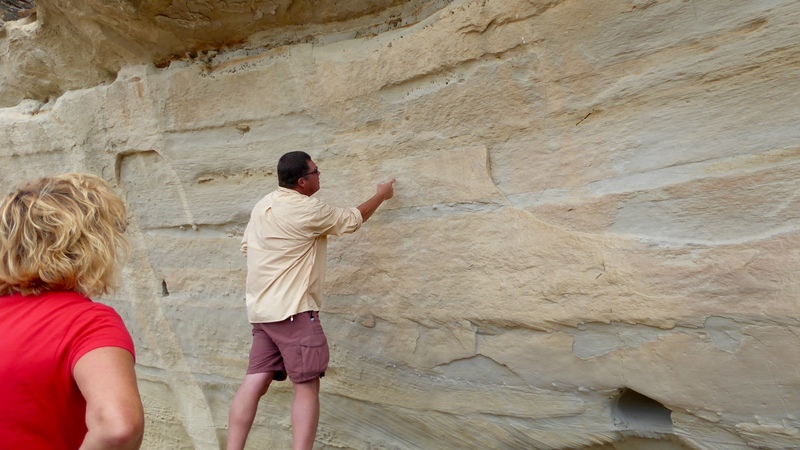 With directions as to where to look, we were able to find the name G.CROOK and the date 1876 carved in the rock. 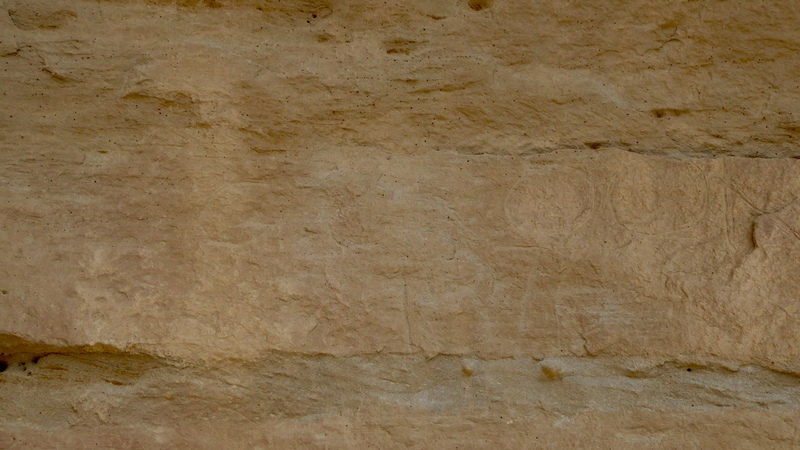 The carving in the picture is quite faint but it is distinguishable in direct viewing. Only the R and the 8 have worn to the point that you have to assume them. 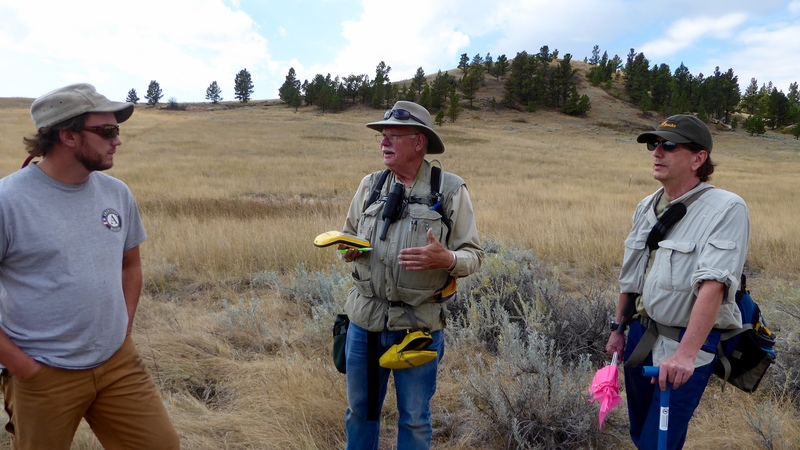 We even learned something about Elko at the Rosebud Battlefield State Park. Tyler, pictured above with the archeologists (on the left) watched Elko run his nose along the barbed wire fence (presumably to determine if their was a barb) before he crouched and crawled under the fence. Obviously he didn’t learn that in our backyard in Boise! We have always suspected he had been a ranch dog in his former life (because he showed us years ago that he can herd cows) and that seems further confirmation. He is such a smart boy! 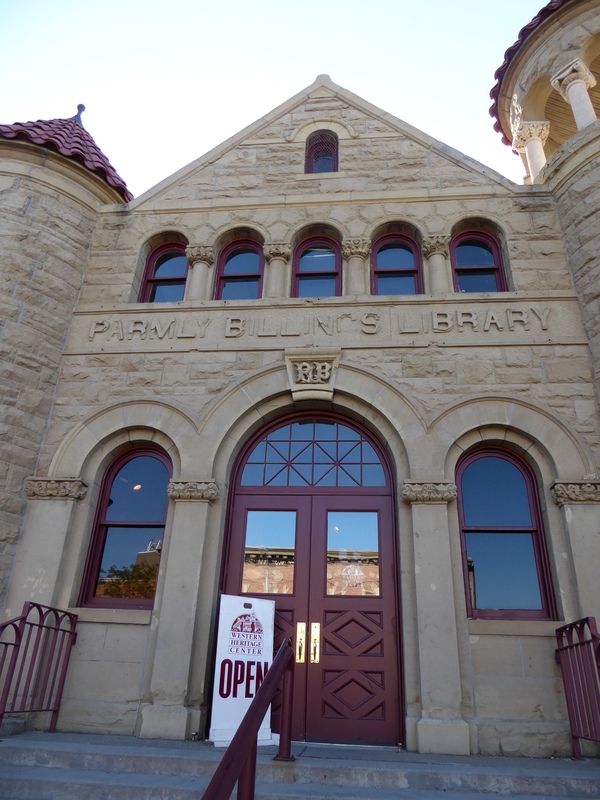 We have learned so much in this place – and we love that! Additionally, Randy has also been able to share some learning. 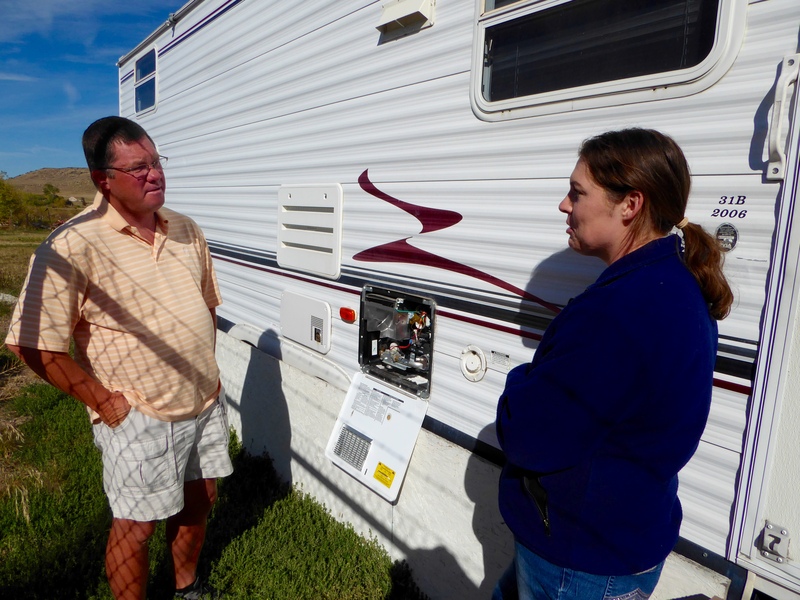 Casey, the current Americorp volunteer, lives in a trailer supplied here at the park. Although the water heater appeared to work well, the water in the sink and shower never got above lukewarm. This has been a problem for years…. Recognizing that Randy would be the expert on all things RV, Casey asked him about it and he figured out the problem in moments. His work task tomorrow – our final day, will be to write a brief manual for the operation and winterizing of this trailer. Today, after one more trip into Billings for groceries, we are wrapping things up. As I write our last Montana blog, Randy is cleaning our truck in preparation for departing. Clean is good as we will be spending more time in the truck going forward than we have in the last few months. These last months have taught us things about ourselves and about what we want going forward with our volunteer “career.” We have enjoyed each of the three places we have volunteered this summer and have valued each in different ways and for different reasons. Even so, volunteering for four of five months, over three different states, is more than we will do again. We also now know that we want our future volunteer service to be less structured – not specifically tasked with scheduled hours. That is good to know because my dream volunteer job had been to be a lighthouse docent on the Oregon coast. I don’t think so anymore. We have absolutely no regrets about how we’ve spent this season. We are blessed to have the opportunity to live and learn – even about ourselves. Volunteering is certainly a journey where we learn a lot about ourselves! I chuckled when I saw you use “bison.” After training ourselves to use “Native Americans” and “bison” for so many years, this place has totally undone that. The Crow refer to themselves as Indians and those big animals as buffalo! We’ll see how long it takes us to unlearn that!